The Iron Man 2 glove, 3D printed along with the rest of the Iron Man suit. Hollywood has long been an early adopter of new technology, wowing us with dazzling computerized special effects. Now they’ve discovered the hottest new technology around: 3D printing. But it isn’t being used to create more of those mind-blowing special effects, but instead for modeling and creating some of the physical items that are used in movies. CNET just recently ran an excellent story covering this trend, titled Why Hollywood loves 3D printing. It notes how when Paramount Pictures and director Jon Favreau were making “Iron Man 2,” when it came time to create the Iron man suit, instead of the traditional route of hand-making it, they instead designed it on a 3D modeling program and then printed it out on a 3D printer. And why not? 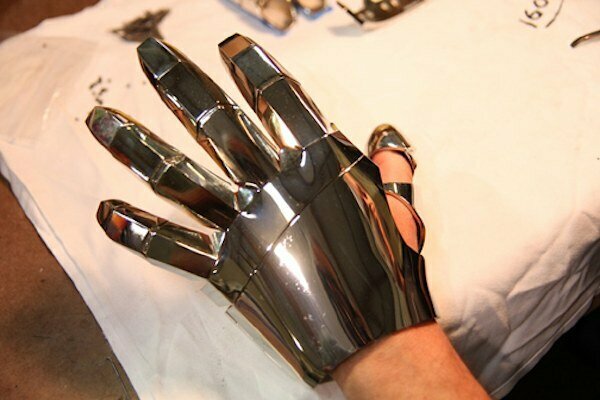 As Lopes explains it, when his team is working on a visual effects project for a major film, 3D printing provides an easy and efficient way to advance through the process of getting approvals on each new round of work as they create complex costumes or suits for their producer clients. For example, Lopes said, when Legacy Effects is working on a suit for a client with an effects-heavy film, it’s necessary to take concept art provided by the producers and, step-by-step, turn that art into full-scale models. In the past, that meant creating new handcrafted foam models at each step of the way. But now, because they’re starting with 3D reference art provided by the client, Lopes and his team can simply print out, say, a one-quarter-size model, and present it to the client for approvals. Then, based on the feedback they get, they can go back to the reference design, make any necessary changes, and print a larger version. Eventually, Lopes said, the process scales up to full-size, and at that point, the effects team can produce anywhere from a single element of a suit to a full-scale suit by printing its component parts and painting them. And because they are made using the same 3D reference designs that are used to create computer-generated suits for all-digital scenes, the physical and CGI versions should look exactly the same to the popcorn-munching viewer, allowing directors to craft scenes that have either all live-action or all CGI, or a combination of both. In the video, you’ll see that Lopes is using an Objet’s Eden260V 3D printer. I’ve got to hand it to Objet — these guys really put together some great videos that highlight how industry uses their 3D printers. Great marketing. While the world seems to be still saying, “what’s 3D printing?” behind the scenes, industry after industry is finding that 3D printing helps them do what they do better and less expensively.